On January 4, 2013 I posted a video of Norwegian soccer player, Harvard Rugland, performing some amazing kicks with a football. The video show him making kicks that almost seem like trick photography. At that time I said, “Somebody give this guy a scholarship.” Well, he didn’t get a scholarship, but he did get a contract with the Detroit Lions. 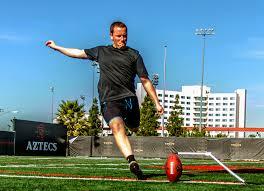 If he makes it, their kicking game may become the most entertaining part of their team.